Happy Thanksgiving too all ! 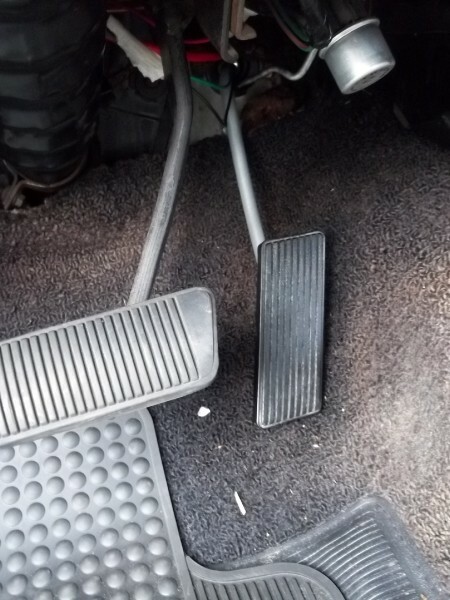 And on this day , I have Finally gotten around too Reinstalling the Original Pedal system and removing the Granada Cable & Pedal . ( Because I wanted my passing gear hooked back up. And Changed oil to lighter weight oil for winter . I Added a Chromed oil filter cover, I have had for twenty five years ! I got a Carb spacer that steps down a 1 3/4" to a 1 1/2" carb so I can install the rod linkages . And Job Well Done !!!!!!!!!!!!! Last edited by falconcritter on Thu Nov 22, 2018 4:13 pm, edited 1 time in total. 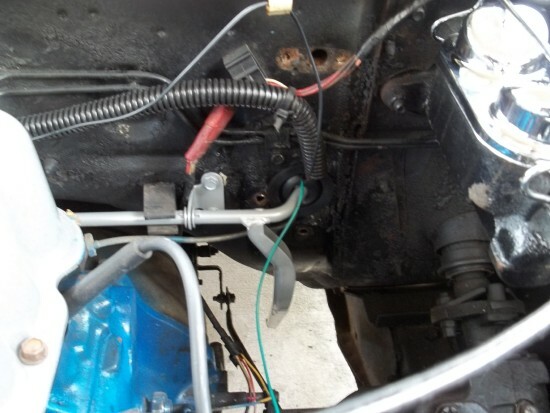 Are you running a PCV/breather line from the front and the back of the valve cover? You should only be running one, with just a breather cap on the opposite. If you have one line to the carb base, and one to the air cleaner, your setup is trying to flip/flop ventilation. The PCV valve is a one way valve out of the valve cover. You have 2 different levels of vacuum fighting each other at different r.p.m.s. I just fixed this issue on a customer's '71 Mach 1. It should be set up so that just one side has a breather cap, and the other has the PCV. One inlet, one outlet, so that the air is always drawn in one direction. At some r.p.m. range, you are not getting any ventilation when the vacuum at the air cleaner is higher, due to the PCV on the other end, or when the two vacuum levels cancel each other out. 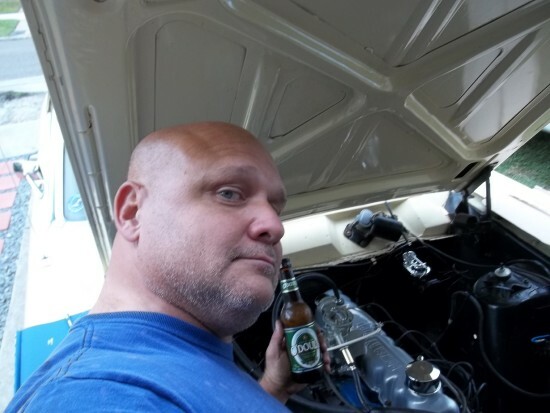 Best to run the PCV to the air cleaner, instead of the carb base, so you are not venting the crank case oil soaked air right into the intake log. Should only be one. There's no place other than the valve cover for the crank case to draw in air. I will give it a try . Passing gear is a must have. Your PVC system looks great too. When I "picked and pulled" my 1978 Fairmont 200ci head and gas pedal cable linkage I took the down shift linkage too. 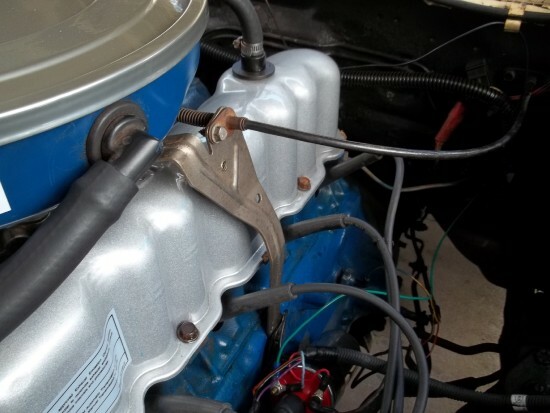 The down shift linkage bolts to the 1978 head and the C4 bellhousing and is not a cable. I don't like it but it works. From what I have read C4 cable kickdown linkage is now available. Your passing gear linkage looks like what was on my old 1966 Mustang Sprint Six. I have been running a Chinese YFA carb with electric choke for a few years no problems. It runs and starts great. 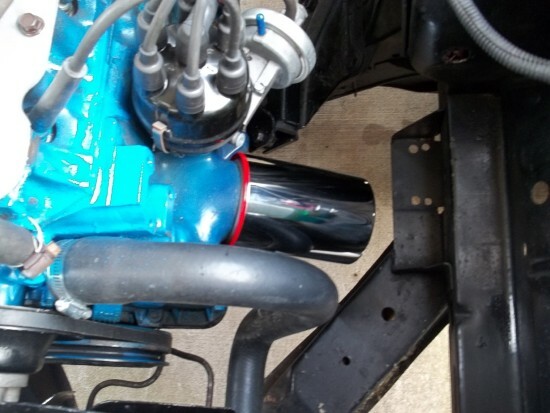 I modified the 1963 Falcon air cleaner to clear the electric choke and fit the bigger YFA carb. Keep up the good work and don't throw away that Granada gas pedal linkage. My first car at age 16: 1956 Victoria 292ci .045 milled heads, Mallory dual point dist, Autolite 4BBL, three on the tree + 3.89 gears. Thanks 63Wagon for the compliment on the Bird ! The cable system was on the car when I bought it . It was one of the first things I focused on , too source the parts for original. I ran into a problem finding a large bore ( 1 3/4" ) carb spacer with the side shaft linkage mount. 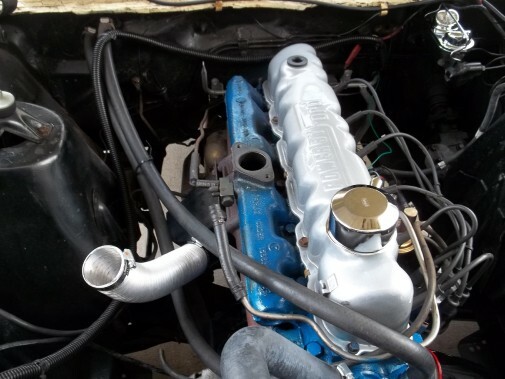 But I got a aftermarket down size to large mount and a carb too match . But now it is all done , I have too convert the choke over too a electric choke . PVC and Breather re-organized . Looking great! Though it looks like your missing the oil breather hose that goes into the air cleaner base? Frozenrabbit says I should not be pulling two sources of PCV but only one . the breather cap pulls in air and the PCV takes it through the carb . instead of breather tube in the air cleaner . I just plugged the inlet on the air cleaner. Just got it back from Mechanics Shop got electric choke put on and new carb adjusted . Waiting for rain to go away to put the Bird on the Highway for a good run ! falconcritter wrote: Frozenrabbit says I should not be pulling two sources of PCV but only one . the breather cap pulls in air and the PCV takes it through the carb . instead of breather tube in the air cleaner . I just plugged the inlet on the air cleaner. Just got it back from Mechanics Shop got electric choke put on and new carb adjusted . Waiting for rain to go away to put the Bird on the Highway for a good run ! I may have been mistaken. In looking further, I've seen it set up both ways. 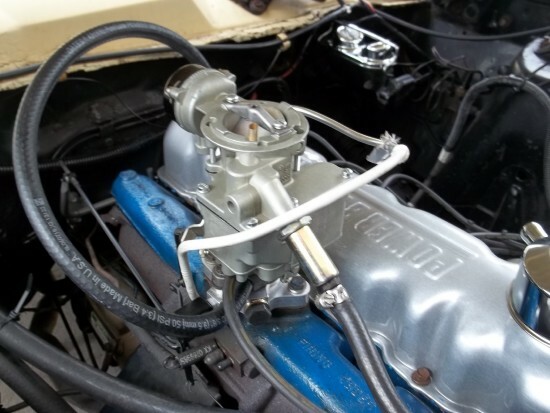 When Ford first went from the down draft tube to a PCV set up, the PCV valve was in the same hole as the draft tube, but was the only line out of the case, with just a breather cap on the valve cover. Ford manual illustrations. But have also seen vacuum to the cap and the PCV both hooked up on later model years. I might have confused things. The guys Mustang I addressed this on had 2 PCV valves, hooked to vacuum, with no inlet breather. It was home modified at some point. frozenrabbit wrote: I may have been mistaken. In looking further, I've seen it set up both ways. Yes that is true that on Ford's early PCV system they used the engine blocks road draft tube boss until the newer blocks were redesigned to eliminate the road draft boss. To my knowledge the PVC system were first required by law in Calif. on all the new 1961 model cars, they were likely used on some of Fords 1960 models to begin testing them too. These early systems were all the open type and were a great first step. By the 1965 year models the PVC system had been already redesigned a few times to arrive at the very best design the engineers could come up with (the closed system) and this type has been used from then on. This proven PCV system works the best to keep the engine running more economically, as well as much cleaner internally, plus improving the engines longevity and number of miles the engine lasts. This design on the inline six engines has the PCV valve at one end of the valve cover with the breather oil fill cap at the onsite other end give the best flow path. Yes you are correct! 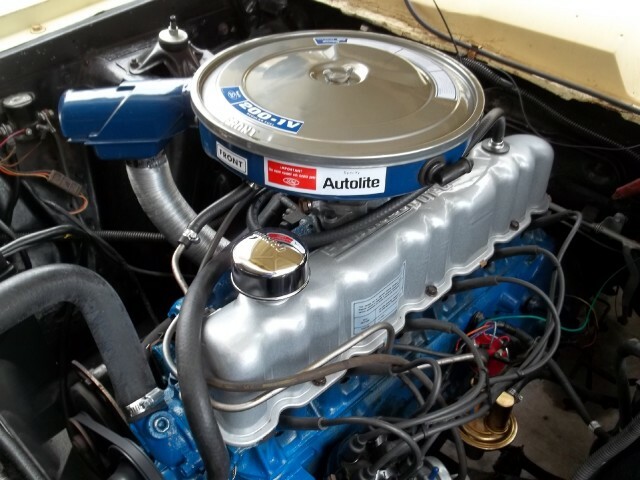 Over the years Ford mostly mounted the PCV at the rear of the valve cover near the firewall, but on many of the later year models such as my 1977 Maverick 250 it was reversed with the PCV mounted at the front of the engine. Regardless of this I believe that the flow path and the goal of ventilating the engines crankcase still works the same even if it's reversed. Yes for sure as an example many times drag racers have used 2 PCV valves (as the class rules allow) on a V8 engine for a little extra performance. Merry Christmas and hope you have a Happy New Year!